O gelato. Why has the public forsaken you? While your American cousin, the ice cream, enjoys the adulation of countless Food Network specials and a monopolizing presence in supermarket freezers, you eek out an anonymous existence. I have to drive to a mall, either mini or mega, to find you. Only the Loch Ness Monster is more elusive. You deserve better. But the very nature of your composition makes mass production impossible. You are made of milk, not cream. And because of its lower fat content, you are a fickle creature. If not served fresh, you'll freeze as hard as a rock in the carton. Though exactly because of your makeup, you melt more cleanly than ice cream in my mouth and with a more refreshing, not-too-sweet finish. I'm glad that Piccomolo, a franchise devoted to churning you out daily, has moved into my neighborhood. Just in time to fend off the oppressive heat of August. Piccomolo's got you presented in rippled heaps inside metal bins and in more flavors than the rainbow has colors. And although they call her "fruit gelato", your sister, the sorbetto, holds her own in another set of bins. Every time I visit, I take freebie samples from both sides. I taste one tiny spoonful here and a tiny spoonful there. It's hard to choose, because you're all so tempting. One night, I finally decide that I must have two flavors slathered by spade into my small cup ($3.50). Donatella (chocolate hazelnut) and Cookies and Cream proved an ideal match-up; A Yin-Yang handshake of vanilla, Nutella and Oreo. Then, on another night, another flavor. This time, a Watermelon sorbetto so ripe and so juicy, it was better than eating the real fruit. Amazing how you've distilled the spirit of summertime into a few ounces. And not a single seed to spit out. Bravo gelato, and your fruity sister too. Mm mm mmm! I may be frugal at times, but I don't mind shelling out $3.50 for a small cup of gelato. I'm hardly around that part of Irvine, but I saw my favorite flavor (Amaretto) on their website, so I might have to pay them a visit! Oh yeah, don't EVER go to the gelato place at The Block. That place is nasty! 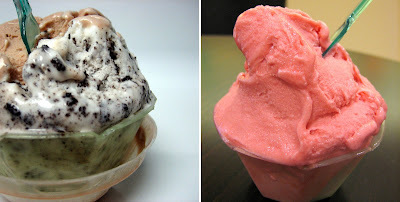 I've been there twice and the texture of my gelatos have ranged from icy/hard to soupy. Gelato is delicious and always hard to find. That gelato looks surprisingly airy to me: which is suspicious. I've always thought gelato should be denser and not as airy as ice cream. Hey Elmo - Looks so refreshing, especially with the hot weather we've had lately. BTW, my verification word is koldh. How apropos. Hah! I really enjoyed the love letter style in which you wrote this post :) You've got me craving gelato now. Fortunately for me, there are SO MANY in Berkeley. There are 5 places within a mere 1-2 miles of one another. oooh deaaar, that looks reeeaaally good...gelato is one thing we do not do well in hawaii! $3.50 is a lot of money isn't it! But this week's Clipper Magazine has a "Buy One Get One Free" offer for Piccomolo on the back cover! Check it out. The consistency was somewhere between soft serve and slightly melted Haagen Dazs. But you're right, denser gelato is definitely better gelato. Totally refreshing! I have a frequent buyer card and I've got only three more stamps before I get a free cup of gelatao. HAHA! Sounds like the Blogger Bot wants in on the gelato too. Lucky! My gelato shops are flung few and far between! But the trend seems to be building. I'm looking forward to a day when I can just walk to a gelato shop. But still. You're in Hawaii! That more than makes up for it in my book. I find gelato...and then I eat it! I agree, gelato doesn't get nearly as much attention as it deserves! Probably because it's much harder to find GOOD gelato in the States than to find good ice cream. But that's the brilliant part of your post: you gave us a location too!! Whee! Thanks for eating all that food. That Clipper Coupon is worth $3.50 if you find it. I've got mine ready to go for the next trip. This one is close to me! But is it close to you? 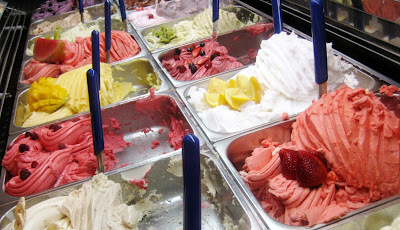 I've got to drive to Gelato Paradiso again one of these days and do a taste comparison. So far, I've been lucky in the choices I've eaten at Piccomolo. You're welcome! And thank you for visiting. the gelato looks delish! must try it some time. 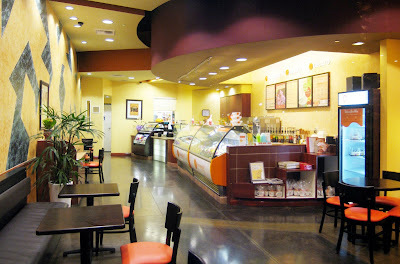 but the store's decor looks very similar to that new mochi dessert place out by heritage plaza mall. i think i've seen gelato there, as well. hmmm... coincidence, perhaps? or just my brain melting from the summer heat maybe. Mochi dessert place?! Do tell! mochi dessert place next to LL Hawaiian BBQ on walnut and culver. i believe its called mochilato, 1.50 for any mochi with a number of different flavors and fillings. SWEET!!! (Literally) Thanks for the tip! after reading your comments, i just had to try piccomolo and they are delish!! i had watermelon and lemon. very refreshing and not too sweet - loved it! oh, speaking of mochi, they have a mochi topping for their non-fat frozen yogurt. i gotta try that next time! I know that there is a yogurt craze going on but nothing is sweeter and dreamier than gelato. 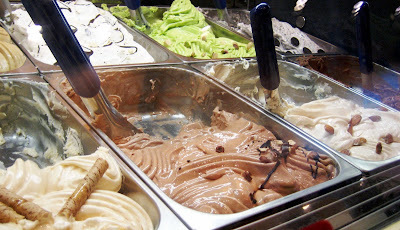 I say if you are going to spend your hard-earned money, go for the gelato at Piccomolo. Great service, great gelato and a great outdoor sitting. Great place to chat or catch up on some reading. I saw the mochi! Need to try that next. I've been there enough times to fill up my stamp card. I'm on my second now. You're right. It's $3.25. I'll make the correction. I haven't been to Yogurtland since I've discovered Piccomolo is in my neighborhood. Not to take anything away from Yogurtland, but gelato dominates my cravings presently. I really have to get back to Gelato Paradiso! Dee-Dee's in Anaheim, a thai/cambodian noodle place known for their "boat noodle" and "Yen-ta-fo," but they also make the more traditional thai dishes such as "pad see ew" and fish cakes(tod mon) pretty decent. Great suggestions! I'll have to put those on my list, especially Dee-Dee. But I have been posting! I've got at least six new posts where this one left off.